One of my favorite comfort foods is macaroni & cheese. I would buy the blue box with the powdered “cheese product” or the yellow box with the creamy “cheese product.” It didn’t matter to me, as long as it was warm and cheesy. There’s a much healthier & more wholesome way to enjoy the flavor of macaroni & cheese without all the chemicals and fillers. 1. Heat oven to 400° F. Place the squash on a rimmed baking sheet, cut-side down, and roast until tender, 40 to 50 minutes. 2. Meanwhile, in a large bowl, combine the ricotta, egg, spinach, garlic, nutmeg, 1 teaspoon salt, and ⅛ teaspoon pepper. 3. With a fork, gently scrape out the strands of squash and add to the ricotta mixture. Mix gently to combine. 4. 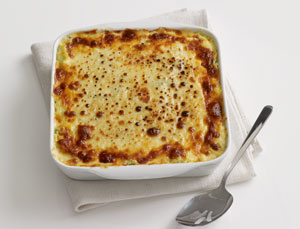 Transfer the mixture to an 8-inch square baking dish, sprinkle with the mozzarella, and bake until browned and bubbling, 18 to 22 minutes. If you like it spicy you can certainly add siracha, chili powder or any other kind of spice or seasoning. I also tried it with green peas instead of spinach and it was tasty. Broccoli might be another great option. We eat a lot of spaghetti squash, so it’s nice to switch up the preparation every once in a while, so it doesn’t taste like the same menu.